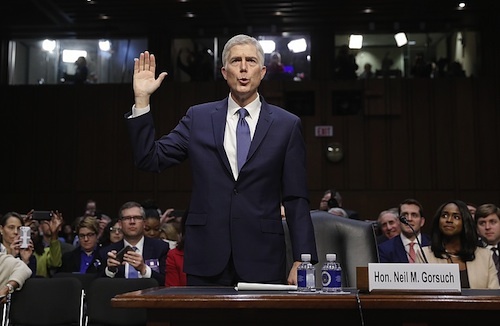 Democrats trying to derail Trump’s appointment of Neil Gorsuch to replace Antonin Scalia's seat on the Supreme Court have been focusing heavily on the “icy thorn” in his otherwise reputable record. The pesky “Case of the Frozen Trucker,” in which Gorsuch took a hard line stance against a truck driver who sued his employer after he was fired for disobeying company orders in the attempt to save his own life. During Monday’s appointment hearing, Sen. Dianne Feinstein recounted the case saying, “the hardhearted judge was not the kind of person who belongs on the Supreme Court.” The case called,TransAm Trucking v. Dept. of Labor came in front of Gorsuch on The Tenth Circuit. 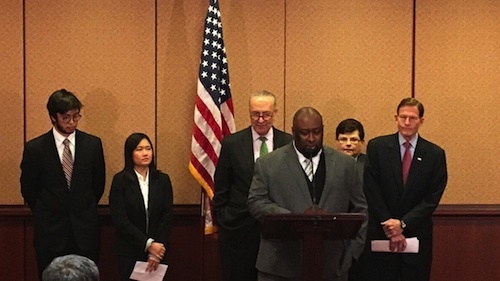 The plaintiff was truck driver, Alphonse Maddin, who was stranded on a road in Illinois one freezing night during a delivery job for his employer, TransAm. He discovered the brakes of the truck were frozen and he was running out of gas, so he called TransAm to notify them. The company told him to wait with his load until help arrived. He waited for hours in the cab of the truck, which was unheated. He called TransAm again and explained he was freezing but they again instructed him to wait in the truck. As more time passed, he began to experience symptoms of hypothermia such as slurred speech, fatigue, numbness and burning skin. He called TransAm a third time, explaining his condition and that he was worried he might literally freeze to death. According to court records, TransAm told him “to either drag the trailer with its frozen brakes or stay where he was.” After three hours in the cold, Maddin couldn't wait any longer and he made his own decision to unhitch the trailer, lock it up and drive the truck in search of gas. Although Maddin’s decision was to essentially avoid freezing to death and although he later returned to the trailer to complete the job, the company fired him for violating orders. Maddin sued the company and went through a seven year process of hearings and appeals. All judges ruled in his favor, agreeing that the termination was illegal under laws that protect employees from being compelled to operate vehicles in unsafe conditions. The company appealed to the Tenth Circuit, where the judges also sided with Maddin, 2 – 1. The one judge who ruled against Maddin was Neil Gorsuch, who reasoned that the driver’s decision to unhitch the trailer and drive the trailerless truck to safety and warmth—was not an option given by his employer and therefore, did not exist under the law. The two other judges who served on the 10th Circuit Court of Appeals panel with Gorsuch disagreed and took issue with his insistent focus on the fact that the driver operated the vehicle. On Tuesday, Gorsuch was given the opportunity to respond to the criticism about his ruling on the case and he again defended his position. "The law as written said that he would be protected if he refused to operate and I think by any plain understanding he operated the vehicle," Gorsuch said. "My job isn't to write the law, Senator. It is to apply the law. And if Congress passes the law saying a trucker in those circumstances gets to choose how to operate his vehicle, I will be the first one in line to enforce it." 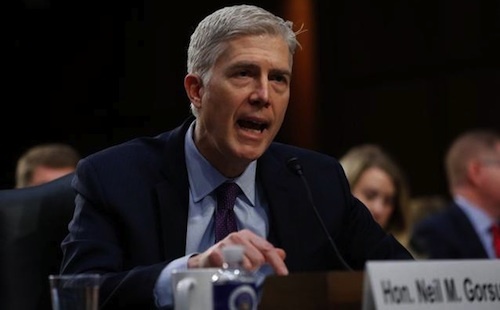 As the appointment hearing continued into Wednesday, Democratic senators aggressively questioned Gorsuch on issues such as abortion rights, the travel ban, torture and the Constitution’s “emoluments clause,” in efforts to put distance between the judge and Trump.